This is Megan's third year as a Volunteen at Methodist Women’s Hospital. Among her many volunteer tasks, she especially loves making the colorful nametags and decorations for the NICU babies’ rooms. 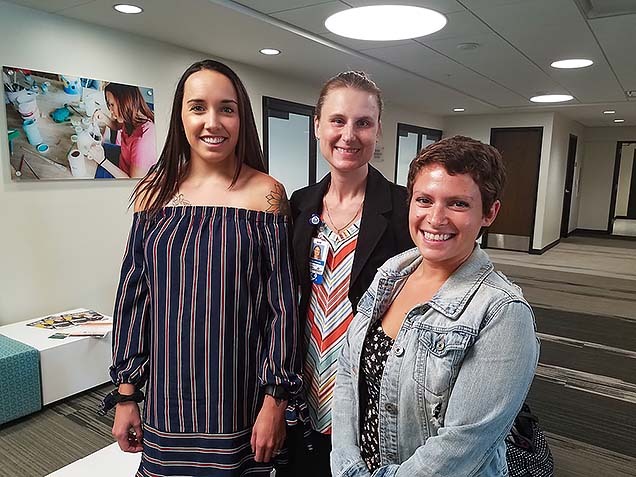 One of the people helping Megan explore learning opportunities and career options is her mother, NMC nursing instructor and alumna Pam Jacobsen, MSN 2015, BSN 2008, CPST. When a recent mother-daughter conversation touched on ways to give back to the community, Pam shared an email with Megan. It was a call for donations for the NMC Food Pantry. Megan requested and received permission to circulate flyers to the volunteers at Methodist Hospital and Methodist Women’s Hospital, and to place collection bins in the volunteer offices on both campuses. 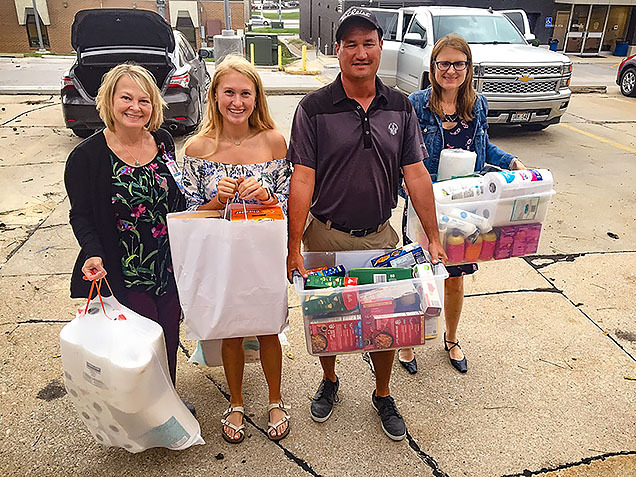 During the 2-week drive, Megan collected more than 550 items—a combination of food, paper products, and cleaning supplies. This week, Megan’s parents, Dave and Pam, helped her make the delivery to the NMC Food Pantry. “I was super-excited to deliver the items,” said Megan. And Lisa Johnson, NMC’s director of TRIO Student Support Services (a federally funded program of the Department of Education), was delighted to receive the large donation. NMC thanks Megan, her fellow Methodist volunteers, and all those who contribute to the Food Pantry for their generosity! Why is there such a real and increasing need for food pantries on college campuses? 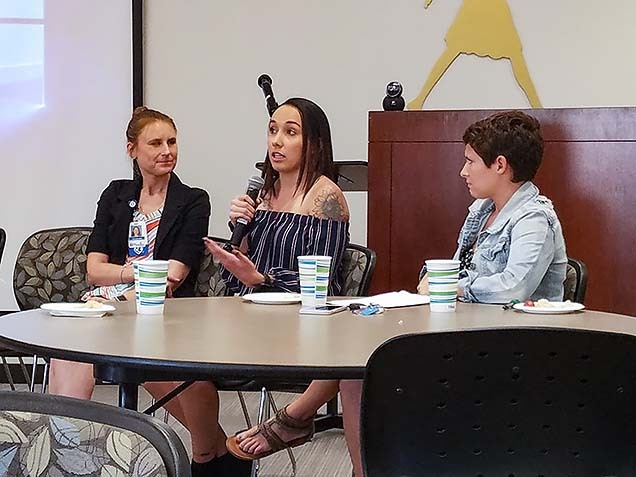 The issue was at the center of a special community summit co-sponsored by Nebraska Methodist College and College of Saint Mary on Constitution Day, September 17. Representatives from several community organizations came together to discuss and develop actions plans addressing food insecurity in higher education. The net price of college has risen dramatically while family income has stagnated. Few college students fit the outdated stereotype of a ful-time student, age 18-22, living on campus with a full meal plan and financial support from parents. The non-traditional student has become the average student. More than two-thirds of college students are also working, and more than one-quarter of undergraduates are parents. Nearly half of first-year college students live at or below the poverty level. Half of U.S. undergraduates are food insecure, which means they have limited or uncertain access to nutritionally adequate and safe food. A food pantry is one immediate intervention for this complex problem, and food pantries are available at about 600 colleges. Research shows that greater success comes when campuses promote awareness and convenience through a normalized process that destigmatizes use. Dr. Lisa Johnson spoke about the origin and steady growth of the NMC Food Pantry, located on campus in the lower level of the Jean Beyer Alumni Center. 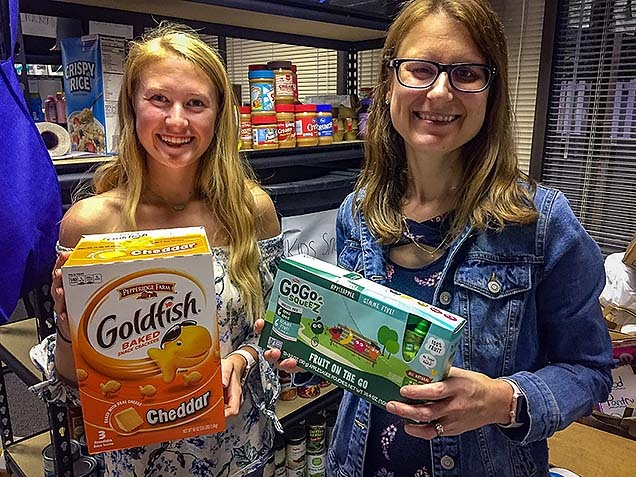 The shift from a drawer of emergency food to a stocked pantry was accelerated by the outpouring of donations from NMC faculty and staff in response to emails outlining the need. 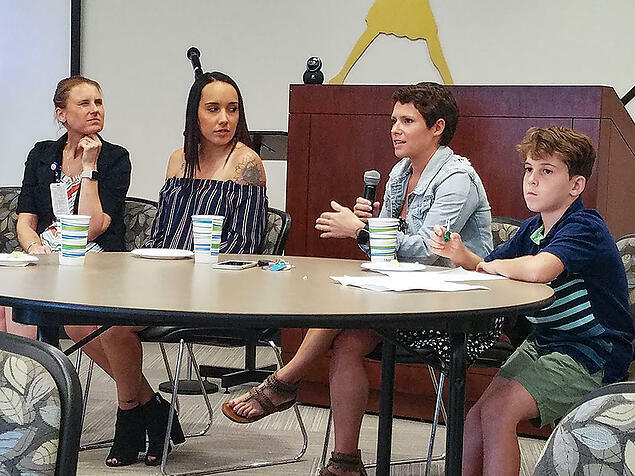 The two student speakers at the summit, both from NMC, shared personal insights, speaking frankly about the challenges they have faced and the impact of the NMC Food Pantry. Courtney is an NMC nursing student and student ambassador, certified nursing assistant, single working mother, and proud parent of Creighton, her 5-year-old son. She admits she has struggled to juggle school, work, and life in Omaha, which is three hours away from home and family. Courtney had just turned 19 when her son was born. A week later he was diagnosed with cystic fibrosis. 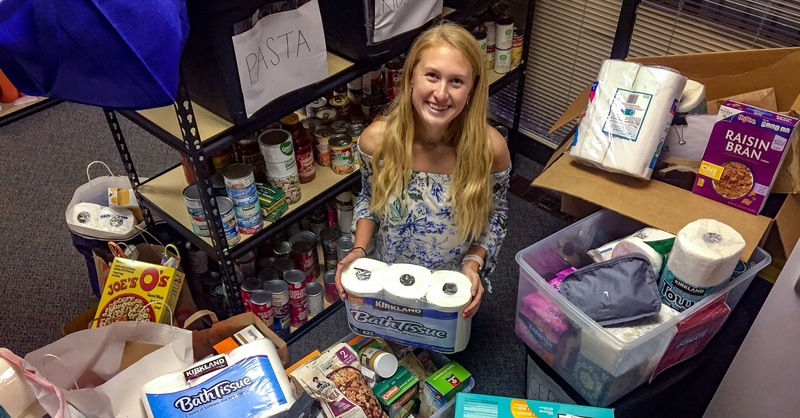 Courtney has counted on the NMC Food Pantry and other support services on campus. Amanda Harvey started working toward a BSN degree eight years ago, when her son, Hylan (above, at far right), was two. “I was working two jobs, struggling to afford part-time community college and pay for rent and food,” said Amanda. The journey has been a long one, and now Amanda is in her senior year at NMC, while also helping other students access the Food Pantry and other services that have helped her and Hylan. Amanda says she was ready for the academic challenge of nursing school, but not the cost of college and lack of income that comes with not being able to work more shifts while going to school full-time. It’s a problem that can make college students uncertain of where their next meal is coming from—especially if they don't know to reach out for help. Amanda considered taking a semester or year off school to work even more, but she knew she might never return. Now she sees the finish line in sight. Do You Need Help? Or Want to Help Others in Need? Information is available online about a full range of support services available to NMC students, including services available to first-generation college students, low-income students, and/or students with disabilities who qualify for the TRIO program.